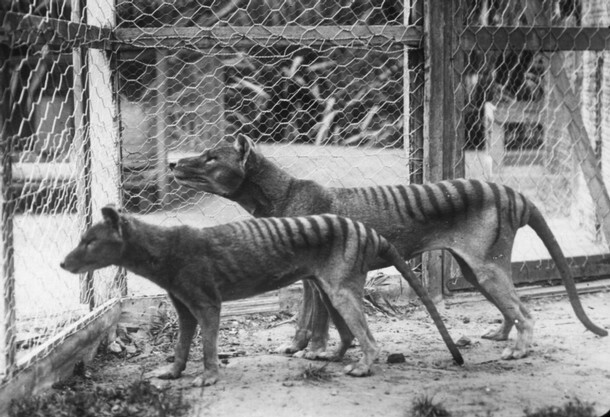 Tasmanian Tigers at Beaumaris Zoo, Hobart c 1918.
via University of Adelaide Marketing Communications team. Humans alone were responsible for the demise of Australia's iconic extinct native predator, the Tasmanian Tiger or thylacine, a new study led by the University of Adelaide has concluded. Using a new population modelling approach, the study contradicts the widespread belief that disease must have been a factor in the thylacine's extinction. The thylacine was a unique marsupial carnivore found throughout most of Tasmania before European settlement in 1803. Between 1886 and 1909, the Tasmanian government encouraged people to hunt thylacines and paid bounties on over 2000 thylacine carcasses. Only a handful of animals were located after the bounty was lifted and the last known thylacine was captured from the wild in 1933. "Many people, however, believe that bounty hunting alone could not have driven the thylacine extinct and therefore claim that an unknown disease epidemic must have been responsible," says the project leader, Research Associate Dr Thomas Prowse, School of Earth and Environmental Sciences and the Environment Institute. "We tested this claim by developing a 'metamodel' - a network of linked species models - that evaluated whether the combined impacts of Europeans could have exterminated the thylacine, without any disease." The mathematical models used by conservation biologists to simulate the fate of threatened species under different management strategies (called population viability analysis or PVA) traditionally neglect important interactions between species. The researchers designed a new approach to PVA that included species interactions. "The new model simulated the directs effects of bounty hunting and habitat loss and, importantly, also considered the indirect effects of a reduction in the thylacine's prey (kangaroos and wallabies) due to human harvesting and competition from millions of introduced sheep," Dr Prowse says. "We found we could simulate the thylacine extinction, including the observed rapid population crash after 1905, without the need to invoke a mystery disease. "We showed that the negative impacts of European settlement were powerful enough that, even without any disease epidemic, the species couldn't escape extinction." The study 'No need for disease: testing extinction hypotheses for the thylacine using multi-species metamodels', which also involved Professors Corey Bradshaw and Barry Brook from the University of Adelaide's Environment Institute, Professor Chris Johnson from the University of Tasmania, and Dr Bob Lacy, Chicago Zoological Society, has been published online in the Journal of Animal Ecology.